We see it every day: children in elementary and middle school using tablets and smartphones to access apps and games. Often these children are unsupervised while they are using the device, which makes us wonder “who is making sure that child isn’t doing something they shouldn’t be doing?” Hopefully the parents of the children we see in those situations have taken some precautions that we cannot see, like setting restrictions on the device or knowing exactly what apps and games are available on that device at all times, but even the most tech savvy parents struggle with setting those limits. Kids and teens are asking for personal devices, like smartphones and tablets, earlier than ever, and with those devices come a lot of other issues that parents need to be ready to face. I spend much of my time traveling to schools in South Carolina where I often host sessions for parents to help them understand technology better and learn how to help their children navigate the digital landscape more effectively. One of the questions that I receive most often is “how old should my child be before they can [insert any technology-based activity here]?” I get this question so often that I’ve begun to incorporate it into the presentation just so parents don’t have to ask me every time. While there are a lot of great guidelines out there to help us answer this question, it is a difficult one to answer. Parents love clear, decisive answers to questions, but unfortunately not all questions have these kinds of answers. Today we are going to focus on Social Media specifically, but we’ll touch on some other issues as well. How do they know the age of the user? Most social platforms willingly enforce this rule as to avoid any issues from the beginning, but not every social platform tackles this problem head on. Some platforms, like Facebook and Ask.FM, ask users their date of birth or age as a part of the registration process, refusing any users who identify themselves as under the age of 13. Other platforms, like Twitter and Instagram, inform users that by creating an account that they agree to the terms and conditions of the platform, which includes being 13 years of age or older, but the platform never explicitly asks the user to provide their date of birth or age. Unfortunately, child users do not know that they shouldn’t use the platform if they are under the required age, and the information is never clearly presented to them. I speak directly to elementary and middle school students on a regular basis and often when I ask “How old do you need to be to use Social Media apps, like Instagram and Snapchat?” I am met with answers that range from “eight” to “twenty-one!” While we know that children would most likely ignore this requirement and create the account regardless of their age, it still removes an opportunity for the children and parents to make a more informed decision on what social platforms their children should access. What is interesting about this information is that is doesn’t only apply to information that the platform requests of its users, but it also applies to all of the information that the users willingly or voluntarily share. This means that if your child shares a picture of themselves, an audio file with their voice, or a piece of geolocation data, then the company has technically violated COPPA if they knew, or had reason to believe, that the user was under the age of 13. These are companies that manage millions of users daily, so trying to turn their attention to specific accounts based on age is difficult. The companies typically do their best to respond to reported violations, but since these issues are managed on a case-by-case basis, it is unlikely that any sweeping action or reform is coming soon. Try Social Media with your children. Just because they aren’t allowed to create an account and share their information online doesn’t mean that they can’t participate. By downloading and using a social media platform you can help model the proper behavior for your children before they have access to a similar platform on their own. Make videos, take pictures, and explore social media as a team through your account, that way you have control over the content that is published and the communication that might take place as a consequence of that material being placed online. Look for other ways for your children to be online safely. Social Networks aren’t the only way that children can go online and feel like they are interacting with others. 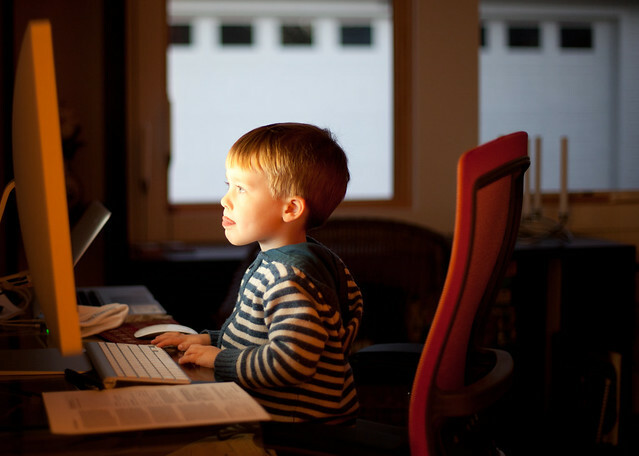 Online games made specifically for younger children offer the opportunity for them to communicate with others without having to provide any personal information or details. Also, your child’s school may use classroom-based tools that mimic social media, which allows them to get the experience of communicating with other users online without putting themselves at risk. Talk to them about Social Media safety long before you give them access. Let’s face it: your kids are going to do things you don’t want them to do. This might mean that they decide to get on Instagram or Musical.ly without telling you. This could be at a friend’s house or through someone else’s device. If you haven’t taught your children how to stay safe online then they could still be making a lot of these mistakes and now, even worse, you won’t even know about it. By talking to them early and often about these issues, we can help ensure that even when they break some of the rules that they will still remember how to prioritize their safety and privacy. For more information about specific Social Media platforms, visit our Guide to Internet Safety for Parents. Feel free to comment below or e-mail me at jryan@scag.gov with any questions!